The German scientist, based in New Zealand, reflects on coming to Norway to participate in a CAS project on chemistry in extreme environments. If you're already studying chemistry in the far reaches of space, why not travel to the other side of the world to work? Take out a globe and locate Oslo. Now find its antipode. Your finger will probably land somewhere close to New Zealand. 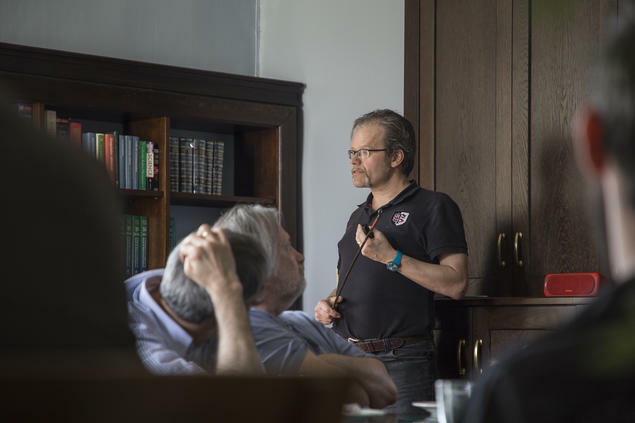 CAS is located in the former; Peter Schwerdtfeger, usually in the latter, in his role as professor of theoretical chemistry at Massey University in Auckland. It also doesn't hurt when the person inviting you to travel halfway across the world is Trygve Ulf Helgaker, professor of theoretical chemistry at the University of Oslo (UiO). Not that Schwerdtfeger is a lightweight himself. 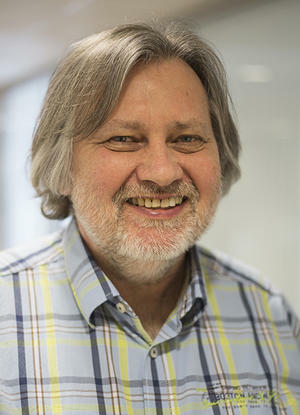 The author of hundreds of scholarly articles, Schwerdtfeger is the head of the New Zealand Institute for Advanced Study and the recipient of research honours that include the Humboldt Prize and the Fukui Medal. Schwerdtfeger and some of his top colleagues at Massey brought to CAS their knowledge about how atoms and molecules behave under high pressure. Others brought their experience with strong magnetic fields. Could the research be combined, and what new knowledge could they produce together? We sat down with Schwerdtfeger toward the end of his stay at CAS. Read the full interview, which has been lightly edited for clarity, below. Schwerdtfeger was one of a dozen scholars who participated in the CAS project Molecules in Extreme Environments. Read our exit interview with the project leader here. - You participated in this project both last fall and this spring. Tell me about the research you've been doing. Peter Schwerdtfeger:The work I’ve been doing here is of course focused on chemistry and physics in extreme conditions. Two foci: One is of course something which interests Trygve Helgaker and is in collaboration with almost everybody, including the other person from New Zealand, Elke Pahl. This is on melting in magnetic fields, which nobody has really touched yet -- how melting processes are affected by magnetic fields. This is important because you have stars with extremely high magnetic fields, so melting points could change. Also, when you look at our planet, you have the crust, and then comes a liquid [layer], and when the temperature goes up in the core, you have a solid [layer]. Of course we have magnetic fields, and it would be nice to exactly know how melting points are affected by magnetic fields. The other project I’m doing more intensively at the moment with Trygve is confinement -- what happens when you squeeze atoms. In the last 20 years quite a number of groups have gone into high-pressure physics because of new materials, for example superconductivity. The highest superconducting transition temperature has been recorded for a piece of material under pressure. Also, when you go into planets like Jupiter, you have extremely high pressure which we can’t even reach on our planet, not even in the lab. At the moment the maximum pressure we can reach is probably around 450 gigapascals. People are now moving up -- perhaps with new designs of diamond anvil cells -- to 700 gigapascals or even a terapascal. Really funny things happen under pressure; for example, some materials which are rock solid, when you put them under pressure, you would think they would stay solid, but they suddenly become liquid. Some metals are totally transparent. We’d like to understand that, because you cannot understand for example how stars and planets behave if you don’t understand high-pressure physics. We can of course look at what happens when we put a single atom under pressure. We squeeze the hell out of it. It would probably be what you find in a block hole, except that our gravitational force can be neglected in an atom. But when you squeeze it, you find some really interesting mathematical features, and we are looking into those. Quite a large number of our team at the moment are working on confinement, and we hope that we could finish it on the last day when CAS ends, but it does not quite look like it. This was perhaps a project which I would not consider so interesting at the beginning, and now it turns out it’s really highly interesting. - I can imagine it takes some time for you all to get to know one anothe and figure out where it makes sense to collaborate. Schwerdtfeger: This is a little bit similar to what we have in other places when you put the best scientists together, like the Los Alamos [National Laboratory] during the Second World War. Suddenly all the best scientists came together -- Fermi and Oppenheimer and many others -- and worked on one theme. You can see what you can achieve in a very small time. Basically it’s not just the sum of every person, but all people, taken together, something more interesting can happen. It’s an environment which blows your mind. This is exactly what you find in our group, that projects developed in a way that we couldn’t see it before. Because many people brought so many different ideas into the one single project, I have to say it was really fun, and we got so many interesting things out of it. If I had done it on my own, I don’t think it would have been as interesting than if many others contributed to it. It’s just amazing. - To make a timely comparison, in the World Cup, you have teams with great individual players that just can’t figure it out. It's not just about individuals, it’s the unexpected collaboration that can occur between them. Schwerdtfeger: It’s a bit like a soccer team. If you only had individuals players, you would not succeed in the World Cup. We all work together, except that the difference is we are not just discussing things, but we are disputing things. We say ‘Wait a minute! I don’t believe it!’ We have these very strong views sometimes, and then we discuss it. If you had that in a soccer team, you would get nowhere. It has to be all coherent. Here we are coherent and not coherent. And then we are coherent again and not coherent. It make science so much more interesting, because we have so many different views on different things. - Some people might not understand how you can study the ‘hard’ sciences in a place like this where you don’t have a lab, you don’t have equipment. How does that work? Schwerdtfeger: First of all, we have all the experts in the field coming together. It’s an environment which blows your mind. At a university, where do you have that? Maybe at Harvard [University] and Princeton [University], when you go to some of the institutes for advanced study. I would very much compare CAS here a little bit to Princeton, only that in Princeton you can be there for 30 years and here you can only be for one year. I think this is a huge success, and it’s also a big advertisement for Norway being involved in science excellence. The other thing is that I’m completely free of my normal duties at the university -- which is all the administration and things like that -- while I’m here. That gives you all the freedom to think about things you don’t have the time to do at your own university. When do you find the time? It’s very difficult, because the administrative load is high. I believe this is exactly the same for all the other people here. It’s just free time, sitting together, discussing every day. It’s a beautiful environment. - If you look back to how you envisioned this stay beore you came here compared to where you are now, are there any major differences? Schwerdtfeger: Yes, my major difference is I don’t want to leave. I’d rather like to stay here. Working in an environment like this is absolutely fantastic. It’s a very good idea. I have to say a big thank you to CAS and also to the Norwegian government. One thing they could do is probably extend it. I think this is a huge success, and it’s also a big advertisement for Norway being involved in science excellence. Maybe they should grow this beyond three groups? Maybe think about doing it for two years rather than one year, or allowing extensions? It is absolutely fantastic. It would be nice to have a similar scheme in New Zealand. We’re trying hard at the moment to establish the New Zealand Institute for Advanced Study and have something similar to what you have here in Norway. Just finding the finances for it is extremely hard. - I understand you're preparing to organise the 18th International Congress of Quantum Chemistry? Schwerdtfeger: Yeah, in 2024. You can imagine that takes time off research. Together with Jürgen Gauss and Trygve, we plan a satellite meeting in Rotoroa. Rotoroa is of course interesting, because that’s where the two continental plates come together. One is the [Australian] plate, the other is the Pacific plate, so you get all this volcanic activity. That’s where you have your extreme conditions. The symbolism! It’s really interesting, because you have hot water springs that come out at around, say, 90-95 degrees celsius, and you have plants -- algae -- growing at these hot temperatures. It means life can exist at over 90 degrees celsius. Life finds a way. - Other than the conference, how else do you see that the work started here will continue? Schwerdtfeger: [Being here] also means you get new collaborations and new scientific ideas and some really interesting topics to work on. It also inspired us to do new things in different areas of extreme chemistry and physics. I didn’t have any collaboration going for example with Jürgen Gauss. We’ve already talked about collaborating, and many others as well. - Is there anything you felt you weren't able to get to during your time at CAS? Schwerdtfeger: The only thing I regret is that the day only has 24 hours. That’s the only thing. It is massive, you know, and we have to finish it. It goes way beyond that one year.